Details took a little while to solidify for a couple of these, but proud to announce some fantastic benefit shows in Austin next weekend, plus a reminder that KU will be in California this weekend! All night long with American Tripps ping-pong! This is my (Kaleb’s) birthday, and it’s also your best chance to sing more than once in Austin this month! 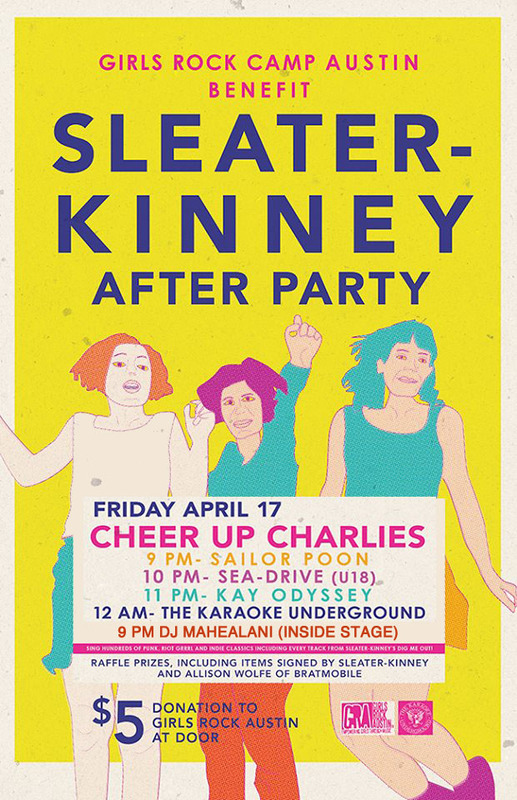 Sleater-Kinney afterparty & benefit for Girls Rock Austin! This is going to be HUGE, with raffle prizes including items signed by Sleater-Kinney and Alison Wolfe of Bratmobile, plus this great lineup of acts with KU! Our good friend Chepo Peña of Karaoke Apocalypse is undergoing treatment for Stage IV Non-Hodgkins Lymphoma. On Saturday, April 18, Karaoke Underground will open up a special Karaoke Apocalypse fundraiser at The Highball to help cover Chepo’s medical costs. Hope you can make it out and have more fun to help a great guy.